The Burgundians, an East Germanic tribe, may have migrated from the Scandinavian island of Bornholm to the Vistula basin in the 3rd century AD. The first documented, though not historically verified King of the Burgundians, Gjúki (Gebicca), lived in the late 4th century. In 406 the Alans, Vandals, Suevi, and possibly the Burgundians, crossed the Rhine and invaded Roman Gaul. 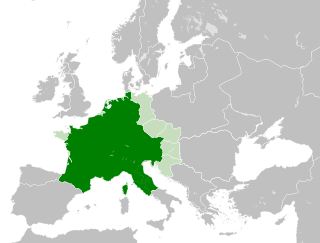 The Burgundians settled as foederati in the Roman province of Germania Secunda along the Middle Rhine. In 411 AD, the Burgundian king Gunther (or Gundahar or Gundicar) in cooperation with Goar, king of the Alans, set up Jovinus as a puppet emperor. Under the pretext of Jovinus' imperial authority, Gunther settled on the western (i.e., Roman) bank of the Rhine, between the river Lauter and the Nahe, seizing the settlements of Borbetomagus (present day Worms), Speyer, and Strasbourg. 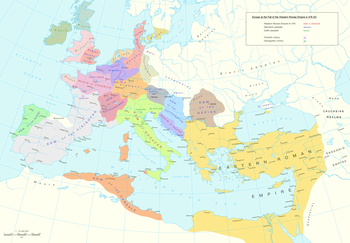 Apparently as part of a truce, the Emperor Honorius later officially "granted" them the land. The Burgundians established their capital at Borbetomagus. Olympiodorus of Thebes also mentions a Guntiarios who was called "commander of the Burgundians" in the context of the 411 usurping of Germania Secunda by Jovinus. Despite their new status as foederati, Burgundian raids into Roman upper Gallia Belgica became intolerable to the Romans and were ruthlessly brought to an end in 436, when the Roman general Flavius Aetius called in Hun mercenaries who overwhelmed the kingdom in 437. Gunther was killed in the fighting, reportedly along with the majority of the Burgundians. The campaign was the origin of the mediæval Nibelungenlied poem. Gunther was succeeded as king by Gunderic (or Gundioc or Gondioc) in 437. After 443, the remaining Burgundians were resettled by Aetius to the Sapaudia (i.e. Savoy) region of present-day central France, again as foederati, in the Roman province of Maxima Sequanorum, where they established their capital at Lugdunum (present-day Lyon). Their efforts to enlarge their kingdom down the Rhone river brought them into conflict with the Visigothic Kingdom in the south. In 451, Gunderic joined forces with Aetius against Attila, leader of the Huns, in the Battle of the Catalaunian Plains. When Gunderic died in 473, his kingdom was divided among his four sons: Gundobad (473–516 in Lyon, king of all of Burgundy from 480), Chilperic II (473–493 in Valence), Gundomar/Godomar (473–486 in Vienne) and Godegisel (473–500, in Vienne and Geneva). After the fall of the Western Roman Empire in 476, King Gundobad allied with the mighty Frankish king Clovis I against the threat of the Ostrogothic king, Theoderic the Great. Gundobad was thereby able to secure the Burgundian acquisitions, and compile the Lex Burgundionum, an Ancient Germanic law code. Later, when Rome was no longer able to afford protection to the inhabitants of Gaul, the Sequani became merged in the newly formed Kingdom of Burgundy. According to Gregory of Tours (538–594), in 493 Gundobad slew his brother Chilperic II and exiled his daughter Clotilde, who was married to the Merovingian Clovis, King of the Franks, who had just conquered northern Gaul. The decline of the kingdom began when they came under attack from their former Frankish allies. In 523, the sons of King Clovis campaigned in the Burgundian lands, instigated by their mother Clotilde, in revenge for Gundobad's murder of her father. In 532, the Burgundians were decisively defeated by the Franks at the Battle of Autun, whereafter King Godomar was killed and Burgundy incorporated into the Frankish kingdom in 534. Flavius Aëtius moves the Burgundians into Sapaudia (Upper Rhône Basin). ^ Hallam, Henry (1871). View of the State of Europe During the Middle Ages by Henry Hallam , Incorporating in the Text Authorʼs Latest Researches, with Addidions from Recent Writers, and Adpted to the Use of Students. J. Murray. p. 63. ^ Prosper; Chronica Gallica 452; Hydatius; and Sidonius Apollinaris. Musset, Lucien. 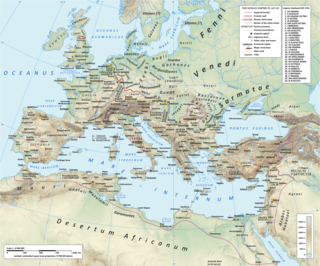 The Germanic Invasions: The Making of Europe AD 400-600. University Park, Pennsylvania: The Pennsylvania State University Press, 1975. Rolfe, J.C., trans, Ammianus Marcellinus. Cambridge, Massachusetts: Harvard University Press, 1950. Shanzer, Danuta. ‘Dating the Baptism of Clovis.’ In Early Medieval Europe, volume 7, pages 29–57. Oxford: Blackwell Publishers Ltd, 1998. Year 411 (CDXI) was a common year starting on Sunday of the Julian calendar. At the time, it was known as the Year of the Consulship of Theodosius without colleague. The denomination 411 for this year has been used since the early medieval period, when the Anno Domini calendar era became the prevalent method in Europe for naming years. Childebert II (c.570–595) was the Merovingian king of Austrasia from 575 until his death in 595, as the eldest son of Sigebert I, and the king of Burgundy from 592 to his death, as the adopted son of his uncle Guntram.